LIBERAL, Kan. – It was a tale of two games for the Saints baseball team (9-6), run-ruling the Trinidad State Trojans in the first game of their doubleheader 15-4, before losing 10-0 in the game two. Liberal native Cole Evans (1-1) started on the mound for the Saints, pitching 4.0 innings. He gave up just four hits and one run while striking out seven batters. Jacob Nielsen pitching 1.0 inning in relief, giving up two hits and three runs. The Trojans scored first in the top of the first after an error by Jose Caraballo, but their lead was short lived. Seward used two explosive innings to take a commanding 10-run lead after just the second inning. Two walks put runners at 1st and 2nd for the Saints in the bottom of the first with two outs. 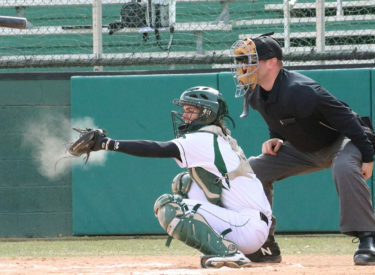 Just as it appeared the inning would end with a Dylan Paul grounder to second, Lucas Quimby mishandled the ball to not only allow Paul to reach base, but to score Braxton Allen. Another walk loaded the bases for the Saints before Cole Bergdall emptied the bases with a double to left field to make it 4-1. A double by Jose Caraballo down the left field line scored Bergdall before Cruz Shope ended the inning with a single up the middle to score Caraballo, bringing the game to 6-1. The Saints got back to work in the second with two singles to start the inning. Spencer Sackett took his first pitch yard, knocking it over the center field wall for a three-run home run. Dylan Paul reached on the next at-bat with a double before Joseph Kuhn doubled to centerfield to bring home Paul, making it 10-1. Bergdall advanced Kuhn to third with a groundout to shortstop and Caraballo grounded out to third to score Kuhn to make it 11-1 after just two innings. Following a scoreless third inning, the Saints got back on the board. A single and walk put runners at first and second for the Saints. Caraballo doubled to right field to bring home Kuhn before Shope homered to left field for a three-run shot, making it 15-1. The Trojans tried to rally to prevent the run-rule from occurring. A hit-by-pit and single put runners on first and second. A wild pitch advanced the runners into scoring position before a ground out scored one run. Another hit-by-pitch put another runner on. Reid Baty doubled to left field to score one run, making it 15-3. Another hit batter loaded the bases before an error by Nielsen on a popup just in front of home plate scored the fourth run of the inning. Nielsen got out of the inning and ended the game with a groundout to Caraballo, giving the Saints the win 15-4 in five innings. Freshman Ryan Thomas (1-1) picked up his first career start, pitching 5.0 innings in the loss. He gave up four runs on four hits while striking out six batters. Dylan Paul, Carlos Vizcaya and Blake Hale combined for 2.0 innings pitched, while giving up six runs on five hits. It was a pitching battle until the top of the fourth. Carlo Mancillas led off with a triple to centerfield. A wlk put runners at the corners for Blake Mattey to hit a sac fly to center field. A double by Dave Gauthier put runners at first and second before Ethan Castro singled on a line drive to center field to score both runs, making it 3-0 Trinidad State. The Trojans picked up the scoring in the sixth following a scoreless fifth inning. A single and a double put runners at second and third, but two straight outs made it appear the Saints would escape the inning. However, a double by Lucas Quimby scored both of the runner. An error by Bergdall on the next at-bat allowed Quimby to score, making it 6-0 after six innings of play. The Saints couldn’t get on board in the sixth, but Trinidad State continued their onslaught in the seventh. Mancillas reached on a leadoff single before Conrado Diaz drove him in with a double to center field, while advancing to third on the throw to the plate. A hit-by-pitch put runners at the corners for the Trojans. An error by Braxton Allen allowed Diaz to score. Quimby brought home another run with a single to center field, and an error by Austin Tidwell allowed a second run to score to bring the game to 10-0 in the final inning. The Saints were unable to rally in the final inning of play, coming away with just one baserunner. Seward will open up Jayhawk Conference play on Thursday at 1:00 p.m. when they travel to Pratt to take on the Beavers.